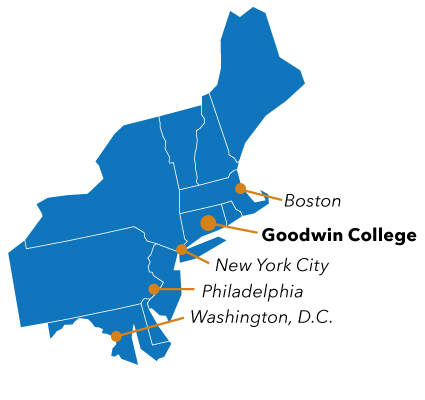 Goodwin College is a small, private college located on the Connecticut River in beautiful southern New England, close to New York City, Boston, Washington D.C., and Philadelphia. We believe in the value of an internationally diverse student population and the cultural perspectives from around the world that enrich our classrooms and community. As a career-focused educational institution, we've designed our international programs around concepts that transcend borders and cultural barriers. We understand that students will want to earn a degree that has immediate value — getting a job and starting your career. Goodwin degrees are driven by employable skills that help our students gain experience and ultimately, strong job-placement back in your home country. Prospective international undergraduate students interested in applying to study in the US at Goodwin College go through the same application process as domestic students with the added requirement of English Language proficiency for applicants whose native language is not English. The full list of admissions requirements for international students are available on this page.